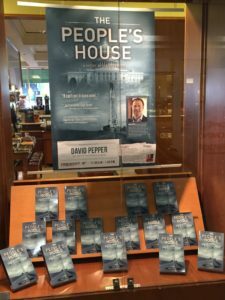 Ohio Democratic Party Chair David Pepper’s first novel, “The People’s House,” on Display at The Booksellers at Fountain Square in Cincinnati. Being a journalist based in Ohio, concerned about gerrymandering and bought elections myself, Ohio Democratic Party Chair David Pepper’s new, first novel, “The People’s House,” speaks to me in more ways than one. It is about a journalist, based in Ohio, concerned about gerrymandering and political intrigue, and uncovering a plot involving globalist corporate chicanery, the power struggle of Washington D.C., and the darkest of political crimes. Pepper has penned an immensely readable novel in the form of a political thriller centered around the investigative journalism of fictional Youngstown Vindicator reporter Jack Sharpe. Sharpe is no intrepid cub reporter, but an almost reluctant, crusty veteran newspaperman, navigating his way through the story of a lifetime. His story is made possible by the gerrymandered creation of only a handful of competitive U.S. Congressional districts in Ohio and throughout the country. It involves the stealing of an election, the mysterious death of an ousted popular incumbent, and America’s reliance on lowest-bidder, county-level election infrastructure to oversee its most important manifestations of democracy. In the background, lobbyists on K Street, political ambition in Washington, and the burgeoning fracking industry in the American Mid-west loom ominously. “The People’s House,” doesn’t just bend the ear and mind of jaded newspapermen such as yrs. truly, but anybody who is interested in American politics, elections, the corner of corporatism and K, and our beloved Buckeye State, famed for its crucial role in critical election cycles. It also speaks to anyone who enjoys quickly-paced, always-guessing, suspense-filled novels. Pepper’s novel traverses Ohio, making stops from Toledo to Geneva-on-the-Lake along Lake Erie, taking state Rt. 11 down to industrial Youngstown, and barging down the Ohio River with stops in Monroe County, Marietta and Hamilton County. Sharpe makes inlets to Ohio’s capital city, Columbus, and Ohio State University. Perhaps most satisfying in the early going of Pepper’s novel is his characters’ candid assessments of the reality of politics and elections in America. Through his characters, Pepper presents insider perspective of harsh and often odious political truth. A little later in the book, a K Street lobbyist gives an honest insider assessment of what corruption is accepted and allowable in American politics, and what crosses the line. A direct hit on the heart of Citizens United. Pepper’s enthusiastic lobbyist, who has wholly embraced and exploited this reality, elaborates. But in Pepper’s novel, these hum-drum if abhorrent machinations of American politics (well known to any student of our country’s history to have long existed) only scratch the surface of the much darker intrigue beneath, as the lobbyist, Capitol Hill staffer and reporter Jack Sharpe are soon to find out. If you’d like to find out along with them, you’ll have to buy the ticket and take the ride, as it goes. Suffice it to say that Pepper’s first foray into noveldom can be viewed as a proud accomplishment. The tightly-woven plot will keep the possibilities open and the reader’s mind at work until the end. Pepper captured Sharpe both as a fully-rounded character and as a representative of the journalism profession with admirable verisimilitude, and Pepper’s cadre of other characters will creep you out, offend your sensibilities, harden your resolve, and embolden your commitment to truth and justice, as the author stitches together a storyline of indictment with a precision befitting of Pepper’s legalistic and political bona fides. The “People’s House” of U.S. Congress may seldom represent the best interests of the American people these days, but the beating heart at the center of Pepper’s novel of the same name never strays from the good faith of we, the people. It is assuredly worth the read. If you’d like to meet the author, Pepper has signings planned for Sept. 23, at The Booksellers at Austin Landing in Dayton at 6 p.m., The Book Loft in Columbus’ German Village on Sept. 29, at 7 p.m., and at The Booksellers at Fountain Square in Cincinnati on Sept. 30 at 11:30 a.m.